I was recently in New York City taking a badly needed and well deserved holiday. I stayed with a friend of mine from high school. When I arrived at his apartment in Brooklyn he had a loaf of the most wonderful home made bread. He has been telling me for a few years now about the no-knead bread method pioneered by Jim Lahey of the Sullivan Street Bakery in Manhattan. Jim's method became wildly popular with food lovers after it appeared in Mark Bittman's column The Minimalist. 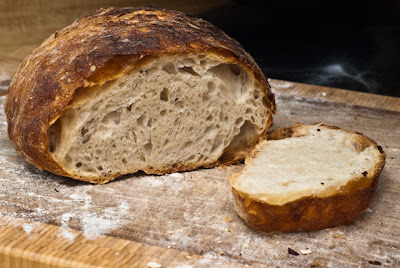 Jim's method really does allow a home baker to produce a loaf of bread that is every bit as good, if not better, than the artisan bread bakerys here in the Bay Area. While I was in New York I decided to visit the Sullivan Street Bakery. I tried the Pizza Puttanesca and a half piece of the Artichoke Strecci. I wasn't wild about the puttanesca sauce on the pizza. In my opinion the fishy flavor from the anchovies overpowered the flavors of the bread and was a little too prominent for a sauce that is so liberally applied to the thin crisp crust. The strecci was bliss. Artichoke hearts and garlic baked in an Italian baguette. Perfect! While I was eating at the bakery I discovered that Jim wrote a book about his no-kneed bread method called "My Bread: The Revolutionary No-Work, No-Knead Method." I have to say I was a little skeptical about the idea that one could produce a bread that was anything close to what comes out of commercial steam ovens, but baked in a home oven. After tasting my friends bread and the bread baked at the bakery from whence this method came I bought the book. This was my first attempt at baking a yeast bread, save for pizza dough. Jim suggests in his book that you start with the basic recipe before trying some of the more extravagant recipes in his book. I won't go into great detail on the method as it is pretty well covered by Mark Bittman in his column. The recipe can be found here. Basically you mix the flour, salt, yeast, and water into a very sticky wet dough. The dough isn't worked or kneaded and looks pretty messy at first. The dough is allowed to rise for 12 to 18 hours during which the gluten in the flour is developed slowly. 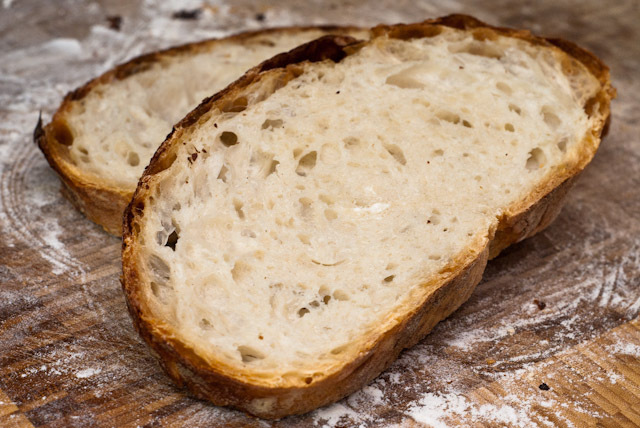 The long rise also allows naturally occurring bacteria and fermentation to bring much more flavor to this basic bread than found in a quick rise bread. Once the dough has risen it is placed into a heavy pot or dutch oven with a tight fitting lid, preferably made of clay or cast iron. The bread is baked in the pot in a hot oven with the lid on for the first 30 minutes of baking. Since the dough is relatively wet baking it with the lid on mimics a commercial steam oven. After 30 minutes the lid is removed and the bread is allowed to bake for 10-30 minutes longer. This allows the crust of the bread to caramelize and become, well, crusty. If you make this bread do yourself a favor and allow the crust to become really dark, but not burned. It will add a wonderful texture and really add to the flavor of the bread. I can honestly say that the loaf I made this morning is the best bread I have ever tasted. 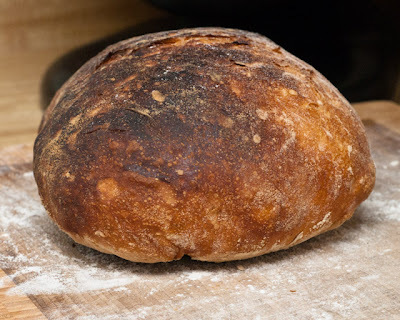 I baked my bread in an oven that was somewhere between 475º F and 500º F. I made a mistake and put the bread in the pot with the seam side down, but I rather like how that turned out, so I may continue to bake the bread this way. I believe that it made the bread rise a little higher at the expense of a wider loaf. I used flour for dusting the dough. Yes! your bread looks great Brad! Brad... I too am a Leahy convert... its pretty cool how basic yet yummy bread can be. Looks great, I've made a similar bread from an Alton Brown show.